In the past few weeks, I’ve been doing quite a bit of traveling in Wisconsin with my now 6-month-old puppy Pip. From the start, she’s been perfect in the car—I suspect it’s because we drove 500 miles from her breeder’s home in Chicago when she was just 11 weeks old, and quickly started taking other trips, so she thinks that’s everyday life for a birding dog. She’s perfectly content to curl up in her little car/airplane carrying case for the duration. Most of the time I don’t even have to keep it zipped—she likes being able to sit up and to get petted as we go along. When I stop for gas, a bathroom break for me, or a quick errand, she doesn’t seem to mind waiting. Of course, I don’t press my luck or her patience, so I stop as often as I can to give her exercise and play, but we’ve done as much as 3 hours of solid driving without a break a couple of times, with nary a complaint. She particularly enjoys being rewarded after a long drive. So far we’ve traveled 6900 miles in the car together. Pip has been to 6 different states and I’ve seen 198 species with her at my side. She quickly adapted to a retractable leash, which I can hook with a carabineer to my belt so my hands are free to use my binoculars or camera. She’s tiny, so the leash is attached to a harness rather than a neck collar. She almost immediately figured out that the leash only goes out so far, and she virtually never tugs; she stops right before it would start pulling her and waits for me to catch up. She also magically stays on the trail, so I don’t have to worry about her messing with or accidentally trampling nests or damaging habitat. When other people or animals are about, I pull the leash in to keep her at my side, and she seems cool with that, too. I’ve never before had a self-training dog. There are some birding situations in which she must be left behind or carried rather than walked. When birding along the Park Point beach this spring after Piping Plovers were spotted there, I popped Pip into a special shoulder bag—it’s so fun for dogs to run on beaches, but the plovers’ needs for a safe nesting spot were far more important. I kept Pip in her bag on the beach OUTSIDE the roped off area. Every dog I’ve ever had before Pip focused on smells more than sight and sound, except when chasing balls or squirrels. But when I let Pip out, she stands on the porch a minute, scanning the skies, trees, and grass with her eyes, turning at any interesting sound, and sniffing—the most observant dog, on every sensory level, that I’ve ever known. She watches and tries to catch butterflies, moths, ants, and all kinds of other insects, but can easily be distracted from entomological pursuits when a bird enters the scene. Over my life, I’ve had three dogs specifically bred for waterfowl or upland bird hunting: a springer spaniel, a spaniel/black lab cross, and a golden retriever. Not one of those ostensible bird dogs focused on birds in every day life the way Pip does. She searches through trees when she hears a robin or other loud singer, tracks flying birds in the sky, and clearly watches birds in the feeder and on the lawn. Pip is more of a general naturalist than I am. She pays close attention to squirrels of course. Our backyard squirrels worked out her speed and motivation levels from the start, and wait until she’s in full pursuit before they saunter away. 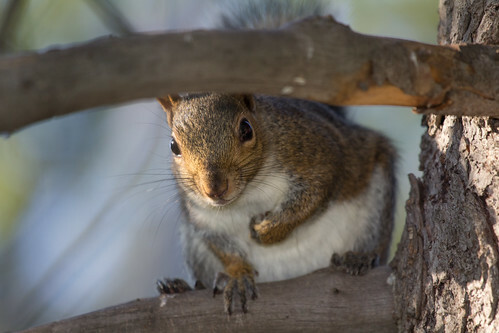 A couple of times, a squirrel barely made it to the tree—they worked out all the timing when Pip was a tiny puppy. She grows faster and more focused by the week, and sometimes it takes them a while to adapt. But they still have the upper paw—indeed, several weeks ago, one chased her onto our porch, probably when she got too close to one of its babies. She doesn’t have much fire in her belly when it comes to them—my guess is that she’s thinking of them as equals to play with rather than prey. One night two weeks ago when we were in Illinois, she made a delightful discovery—lightning bugs! One lit up about a foot in front of her nose, and her head jerked back in astonishment. Suddenly she was seeing them lighting up here and there throughout the yard, and started leaping up toward one and then another, hopping every which way, the way I’d envision a bunny in a marijuana patch. Pip’s reaction to birds hasn’t been quite so exuberant. Her favorite species seems to be the Rock Pigeon—four of them visit our yard a lot, and she watches them closely. She also pays attention to robins, and to Blue Jays if they’re squawking. Geese and ducks seem mysterious and cool, and tinier birds hold her interest, too, though they don’t catch her attention as consistently. I’m sure she’s seen only a fraction of the 198 species I’ve put on her life list. That list is obviously for me, not her, helping me to keep track of all the birding experiences I’ve had with her at my side. Some of my radio listeners have complained over the years whenever I talked about birding with a dog. But birding with a buddy enhances many birding experiences, as long as it’s the right buddy in the right situation. And it looks like Pip is going to be the right birding buddy for me for a long time to come. Nesting Ruby-crowned Kinglet in My Neighborhood! On September 3, 1975, I went to the Flag River in Port Wing, Wisconsin, with my father-in-law. He was fishing, and I was searching for birds. I’d started birding just 6 months before, and that very September day I’d broken 100 on my life list. Now, while he was casting for trout, I spotted a tiny bird flitting about. It was the most active bird I’d ever seen before—not just flitting from branch to branch, but during the second or two when it sat in the same spot, it kept restlessly flicking its wings. There may actually have been a small group of them, this being migration, but I kept looking back and forth between a restless little bird (maybe the same individual, maybe not) and my field guide trying to figure out what it was. I tried to see every single field mark possible. 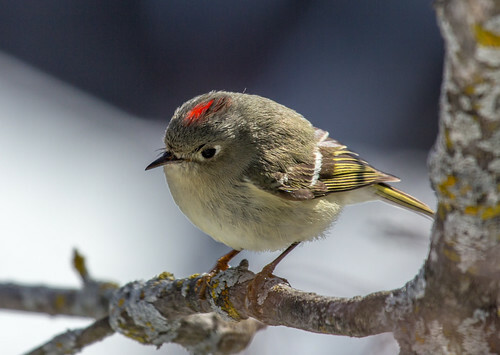 In this case, I absolutely needed to see the ruby crown that gives the Ruby-crowned Kinglet its name. It took at least 10 minutes, maybe more, before I got a momentary glimpse of that. As it turned out, the eye ring, tiny size, and restless habit of flicking its wings would have been enough to clinch the identification, but I’ve always been proud of having seen that field mark in fall, when they are least likely to be raising their head feathers to show it. The Ruby-crowned Kinglet was #102 on my life list. The following spring I learned the kinglet’s song, which quickly became one of my all-time favorites. And after I knew the song, I discovered that Ruby-crowned Kinglets were extremely common during spring and fall migration, everywhere I birded, and turned up here and there, except in the northernmost areas where I birded regularly, in winter. But I had virtually no experiences with them in summer, only once hearing one on my Breeding Bird Survey route. Thomas Sadler Roberts never established that they nested in Minnesota at all until the 1930s, and they weren’t considered a regular breeding species in the state until the 40s. They are known to nest in North Star, Fredenberg, and Gnesen Townships outside Duluth, but only in very forested areas, not right in town. And we’ve had no nesting records within Duluth itself ever. The preliminary results of Minnesota’s Breeding Bird Atlas include 13 confirmed blocks for nesting along with an additional 391 blocks of probable or possible nesting, none very close to Duluth itself. 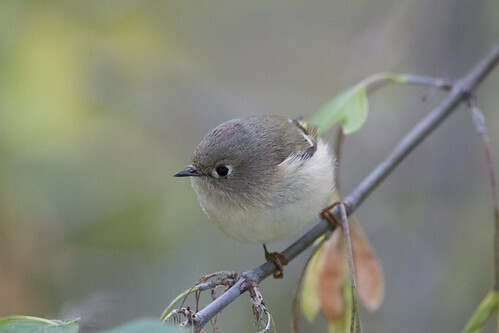 No summer records of Ruby-crowned Kinglet in Wisconsin exist before the 1940s. During the 40s, summer records were documented in 5 counties, but no nests were found in the state until Tom Soulen discovered one in Oneida County in 1964. Sam Robbins noted in his Wisconsin Birdlife that they are restricted to tamarack and black spruce bogs. The first Wisconsin Breeding Bird Atlas, conducted from 1995 through 2000, confirmed nesting in 17 atlas blocks (1.5 percent of all the blocks in the state), and found probable or possible nesting in an additional 57 blocks. The birds documented in Wisconsin's first Atlas program were found in lowland coniferous forests, as Robbins noted, or in upland mixed forests composed primarily of white spruce or balsam fir and hardwoods, the nests usually in spruce trees, but high enough to be very hard to see. No nests have been found in towns or cities in Wisconsin, either. All this seemed important in the abstract to me until this year, when suddenly I took a a more personal interest in Ruby-crowned Kinglets. As I said, I hear them in my backyard every single spring, with a lot of frequency. I had my first in my yard on April 15, about on time for a fairly early spring like we had this year. I did a lot of traveling from mid-April through May, but heard them frequently when I was home. It seemed a little odd to still have them singing at the end of the month, but I was still getting plenty of migrating warblers, so I didn’t think about it being anything out of the ordinary. I wasn’t home on June 1, but on June 2 I still had one—the first June experience with the species singing I ever had except that one time on my Breeding Bird Survey, well away from town. So I started paying attention. I was home almost every day of June, and every single day I was home, I heard the Ruby-crowned Kinglet singing away. That continued not only through June 30, but into July, through the fifth, and a few times since. I’ve not been able to locate a nest, and the birds themselves have been almost impossible to locate even when I can hear the male singing away—the best I’ve done is to occasionally see one flitting through dense foliage high up in the trees. But finally, last week, after hearing the male singing and searching through the branches of my neighbor’s big maple, I got a glimpse of a Ruby-crowned Kinglet carrying food. That counts as confirmation of nesting by Breeding Bird Atlas rules—the first ever in the city of Duluth, so my little singer turns out to be a pretty significant guy, which makes me a pretty happy birder. 2015 has been an exceptional year. This spring, I had more Pine Siskins in my yard than I’ve had in years—often more than a hundred at a time gathering in my feeders and trees well into June. I had lots of warblers throughout May, including both a Connecticut and a real rarity up here, a Blue-winged Warbler. Both in my yard and beyond, I saw more Canada Warblers than I’ve ever seen before in an entire year. To offset all this abundance, I don’t think I’ve ever seen as few White-throated Sparrows in my yard, throughout the entire month of May. That was distressing, but I don’t know if it was a mere blip on their normal migration patterns and their numbers are normal on their breeding territories, or if it represents an actual decline. That’s the trick with all migration numbers—we never know if we’re seeing a sudden decline or population surge, or if we’re merely witnessing the result of odd weather patterns pushing the birds east or west of their normal routes. Even a year or two of high or low breeding numbers in an area can be an artifact of odd weather patterns pushing migrants in or out of an area for a season, or affecting song patterns so more or fewer are detected than normal. That is why we need annual surveys using the exact same protocol from one year to the next, so that over the long haul, measured in decades rather than years, we can see patterns. Since the 1960s, American Robins have been doing quite well across the entire continent, and statewide in both Wisconsin and Minnesota, according to Breeding Bird Survey numbers. But the number in my own neighborhood dropped dramatically after the 1980s—corresponding pretty much directly to both the increase in nesting crows and Merlins in the neighborhood and to the increased use of lawn pesticides. That is excellent evidence that what any of us observe locally may be quite different from the overall trend for a species. I used to have three or four different pairs nesting in my yard and adjacent yards, the territorial males all piping in every morning between 4 and 5 am, and occasionally the male nesting in my own yard singing all night long. They’d get into all kinds of squabbles over my birdbath, too. They’d be on my radar from the day they arrived in April through mid-July when the males stopped singing, and even then I’d often see adults or young birds hanging out. By the mid-90s, though, their density on Peabody Street had decreased dramatically. We still always had a pair nesting in my yard or one of the adjacent yards, but without so many neighbors, the male didn’t spend so much time singing. We still usually had a burst of song before dawn, but it never lasted very long, and we couldn’t hear answering songs from our yard. And our bird never ever sang the night through—at least not when our windows were open. But this year, for the first time I can remember since the 80s, we have at least 3 and possibly 4 pairs close again—I can hear them with or without my hearing aids, so it’s not due to the sudden improvement in my hearing. I'm certainly never wearing them in bed when I hear the male nesting in our front yard as he starts singing every morning by about 4:15. He continues until it’s light enough outside for him to detect worms. The only day he missed that I was aware of was the morning after I’d seen him dealing with at least two and possibly three demanding fledglings all day long. I think he needed his sleep the next morning, but the following day he was back singing at the usual time. The morning I left home at 4 am to do my Mourning Dove Survey, I saw him and his mate doing what birds and bees and educated fleas do, right in the middle of Peabody Street—now they’re finishing up brood number two, and may even have time for a third brood this year. 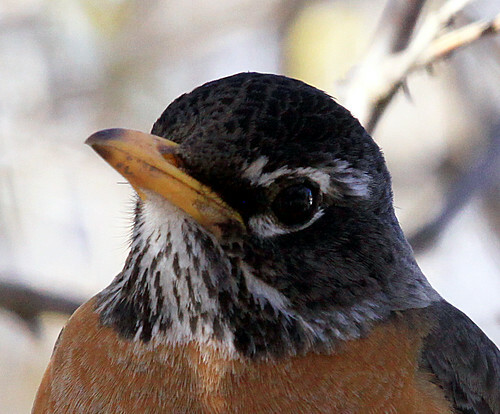 Robins are so abundant and widespread that this is the kind of thing that seems like no big deal to many birders. But their song is so beautiful and bubbly that of all the 700 species found throughout Costa Rica, including myriad brilliant hummingbirds and trogons and tanagers and the Resplendent Quetzal, the species chosen as the national bird is the dully-colored Clay-colored Thrush, which has a song almost identical to our robin’s. 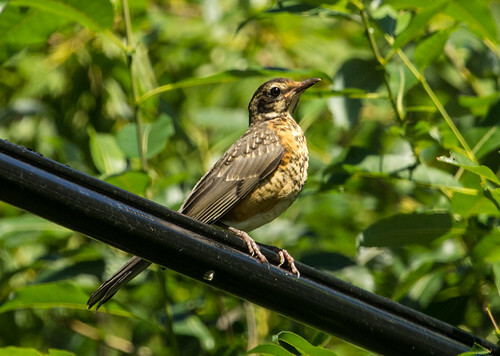 The thrush starts singing each year right when the dry season ends, and hearing the welcome sound of hope and new beginnings tells farmers it’s time to start planting again. 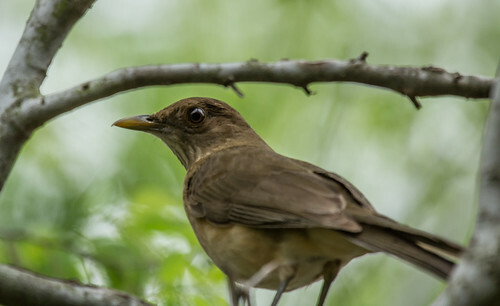 Clay-colored Thrush--this dully-colored species is the national bird of Costa Rica! 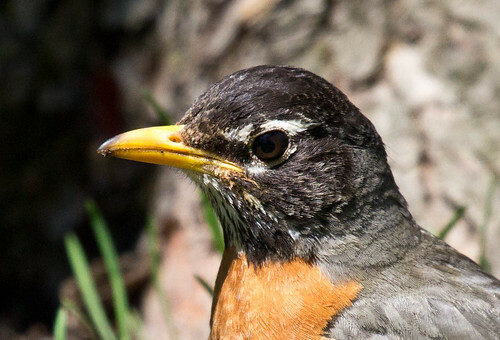 Our homey robins may be birds we can take for granted, but that makes them no less wonderful. And this year’s wonderfully abundant encounters with them here on Peabody Street will remain in my memory as one of the joyful experiences of 2015. 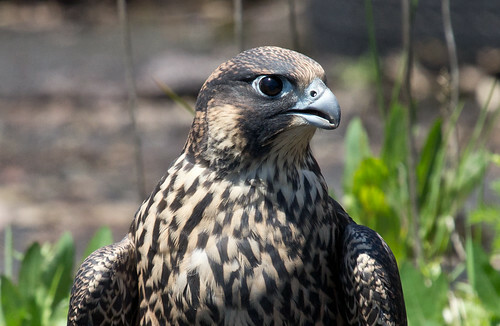 In 1982, Harrison "Bud" Tordoff and several other Minnesotans banded together to start our state’s Peregrine Falcon Reintroduction Program, which quickly became one of several enormous successes of the Endangered Species Act. Ten years later, in 1992, when the project was enjoying its first successes along the North Shore and in a few areas near the Twin Cities and a couple of mining areas, right when some of the first reintroduced birds were first trying to nest on the big bridges between Duluth and Superior, my friend Dudley Edmondson got the idea to put up a peregrine nesting box in downtown Duluth. 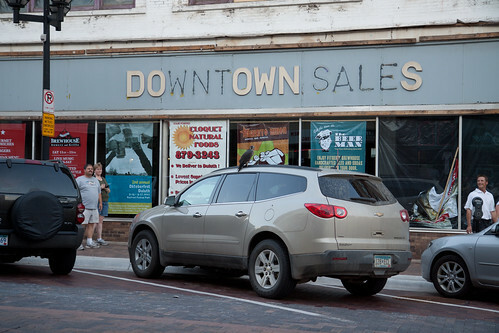 He contacted the Raptor Resource Project of Decorah, Iowa, and they set up a box on the Greysolon Hotel. Although that group is famous for the nest cam they have on their local Bald Eagles, they’ve never worked out a way to put a cam on the Duluth peregrine box. At first, such a thing wouldn’t have worked anyway—it took eleven years for a peregrine to show any interest in the box. Finally, in 2003, a young female who had hatched from a nest in Minneapolis showed up, inspecting the box. She didn’t manage to attract a mate that year, and in the fall, an adult female turned up wanting the box for herself. 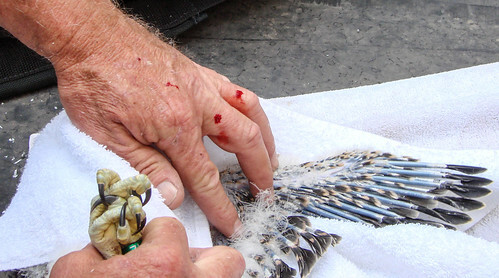 She was not banded, and no one knows where she came from—that was mystifying because every state's peregrine reintroduction program has been, from the start, so effective at tracking every bird they released; they were banding what they thought were all of the chicks produced by birds that had come out of the program. Suddenly, here was a female, seemingly out of nowhere—a Mysterious Stranger. She wanted that nest box, and so she took it. Tragically, Peregrine Falcons do not watch soap operas, so they don’t realize that writers are only supposed to inject a murder into the plotline when the ratings are slumping or they need to write off an actor who is demanding more pay. The less experienced bird fought for the box without thinking through the ramifications of fighting off an older, savvier bird, and she didn’t know when to retreat. She ended up dead, giving the Mysterious Stranger undisputed ownership of the box. In spring the following year, 2004, again out of the blue, another Mysterious Stranger arrived on the scene—an unbanded adult male. The two birds with unknown pasts did what birds and bees and educated fleas and soap opera stars do, and soon there were three chicks in the nest box. On fledging, one got into an accident, broke her leg, and ended up dying at the Raptor Center. Another was killed by a plane in Chicago, and the third’s destiny is unknown. I started working for a company in downtown Duluth in 2005. I didn’t know any of the Raptor Resource people, but spent a lot of time watching and photographing the birds as they raised four chicks. I watched one female make her maiden flight on July 3. She ended up in a parking ramp, and after taking a bazillion close-up photos of her and realizing she could not figure out how to get out of the ramp, I captured her in a towel, managed to get up on the roof of the NorShor Theater, and released her there. During the following few weeks, the four chicks spent a lot of time in the park along the Lake Walk, and I got more photos before they finally disappeared for the year. I later found out, based on her band number, that the Raptor Resource Project people had named the young female I rescued Maggie. None of that year's chicks' destinies are known. 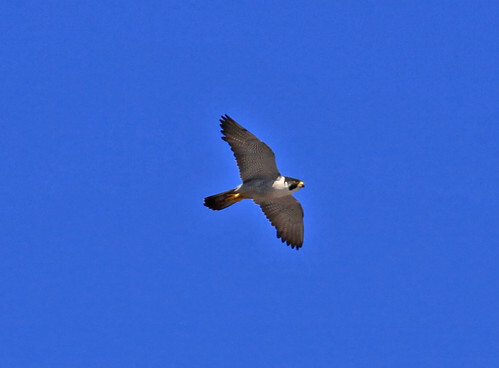 I followed Duluth’s Peregrine Falcons pretty carefully while I worked downtown, but the company I was working for relocated, and I knew I wouldn’t be able to keep such good tabs on the birds in 2006. 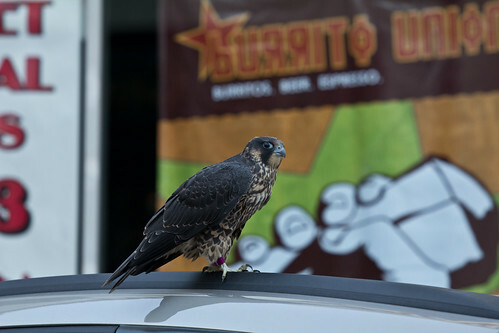 I was very concerned about the difficulties many young urban falcons face when they first fledge. They often ended up grounded, like Maggie had, because they don’t have the wide-open spaces of their natural cliff environments that allow them to work their wings without obstructions when they're taking their first flights. And urban buildings are not only big obstructions—they’re often covered with glass that the birds don’t see, making collisions even more likely. Urban fledglings often need a bit of help until they grow savvier and develop more flying skills. So I contacted Hawk Ridge Bird Observatory suggesting that we needed a regular downtown presence as an organization. It seemed worthwhile to work with people tied in with the Raptor Resource Project, too, so we could get more information about the nestlings each year. 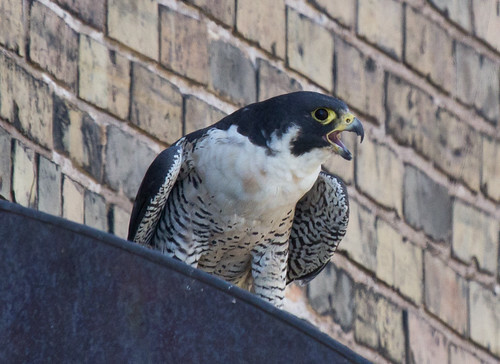 People downtown were already excited about these magnificent birds—giving them information about them along with tips on how to help them if they got grounded seemed good for everyone and sure enough, that’s how it turned out when Hawk Ridge started their wonderful Peregrine Watch program. 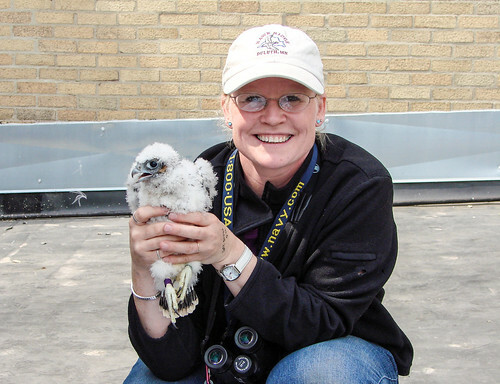 Julie O’Connor became the first face of the project, got the program off to a resounding start in 2006, and her solid knowledge and effervescent enthusiasm made Peregrine Watch an instant success. 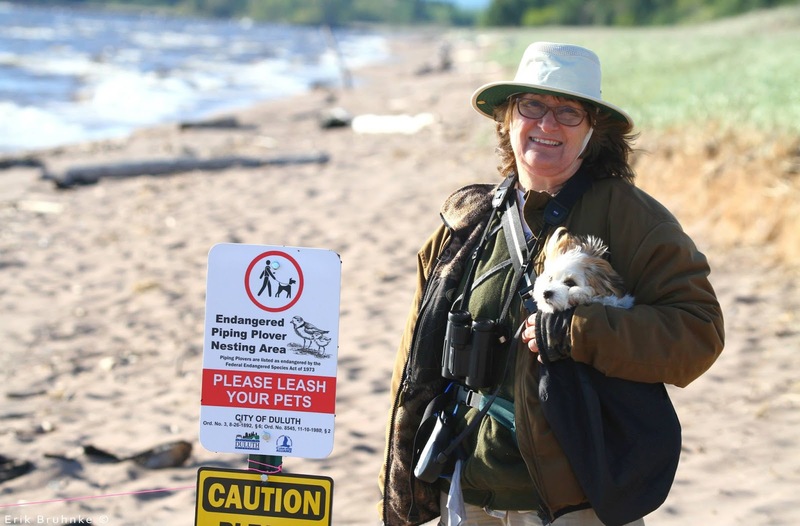 Julie O'Connor at Lake Place Park in Duluth during the 2006 Peregrine Watch program. That year, the same two Mysterious Stranger peregrines showed up again, and again raised four chicks. 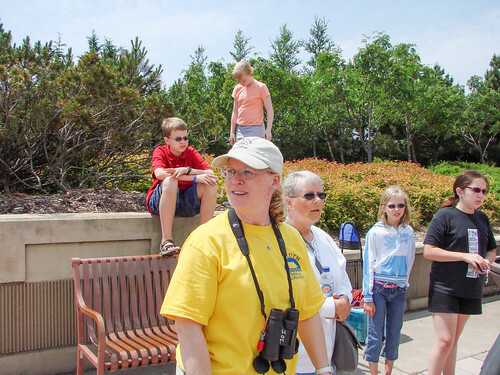 This time, Julie and others from Peregrine Watch were downtown at Lake Place Park just about every day, with a scope on the nest and close up photos of the birds—hundreds of Duluthians and tourists got to see adult peregrines, nestlings, and eventually fledglings up close and personal, and get accurate information about them. Julie told me ahead of time when the nestlings were going to be banded and finagled an invitation for me to join them on the hotel roof. The day before, when the banders were sizing up the situation to decide if the chicks were the right size for banding, the female kept aggressively attacking them. She grabbed the hat off Raptor Resource Project Director Bob Anderson’s head, but the next time she swooped in, they plucked her out of the sky and banded her. Now that she was banded, they gave our female Mysterious Stranger an official name, Amy, (named for Amy Ries of the Raptor Resource Project). The unbanded male, more wisely or less committed to defending his young, has never been caught. Even today, in 2015, he maintains his Mysterious Stranger mystique. “Amy” was extremely riled up by the banders, and the whole time they were working, she screamed all kinds of peregrine obscenities as well as dive-bombing them, providing me with some dramatic photos. Amy cursing out the banders; her language would have been bleeped out on network TV. The late Rob MacIntyre was smart enough to wear a hard hat--we could hear a few loud clunks! I also got plenty of photos of the young and the banding process. Amy and Our Mysterious Stranger continued their summer patterns for four more summers, through 2010. Each year, Amy laid four eggs. Sadly, in 2008 three of the chicks died from a nasty parasitic disease when very young, but all in all, this couple successfully fledged 24 young—an amazing track record. Then, in 2011, Amy did not return. No one knows what happened to her—if someone found her injured or dead, we presume her fate would have been reported to the Bird Banding Laboratory or one of the Peregrine reintroduction groups. Losing her without any knowledge of what happened is not at all in keeping with what we yearn for in soap operas, but quite in keeping with a bird who appeared out of the blue one day. She presumably died sometime between 2010 and 2011. If we were to create a monument to Amy, both her start and end dates would be question marks. Amy’s mate returned, but it’s impossible without a soap opera soundtrack to guess whether he was devastated from grief, didn’t notice her absence at all, or felt something in between. Anyone who claims that birds don’t feel emotions is being completely unscientific, but anyone who claims that birds feel a specific emotion is being equally unscientific. We simply have no way of knowing what is going on in their minds or hearts. But we do know that a seven-year-old female banded in Ontario as a nestling in 2004 showed up and Our Mysterious Stranger accepted her as a mate. This female was simply called B/8 by the people who banded her. 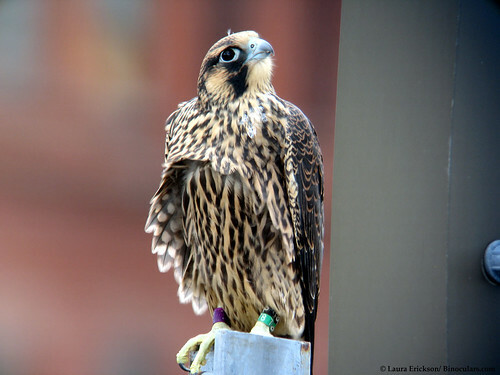 The people at Peregrine Watch started calling her Canada or Jenna. She and Our Mysterious Stranger raised two chicks that year. The banders named one Laura, after me—what a thrill that was! 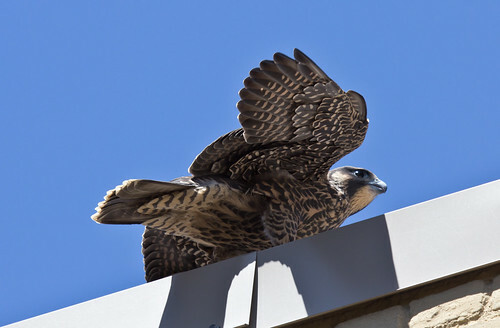 Laura got into a bit of a pickle a day or two after she fledged, and needed to be rescued and placed atop the building again—no one saw her after that day, but we don’t know what happened to her. Laura ended up on top of this car, but was retrieved by a local bander and returned to a safe roof top. In 2012, spring arrived early enough that Jenna and Our Mysterious Stranger started the nest two full weeks ahead of schedule. By the time the banders arrived, the four chicks were too old to be banded without risking them jumping prematurely from the nest. In 2013, Jenna produced four eggs, but one didn’t hatch. And in 2014, three of their eggs didn’t hatch. Their one fledgling that year, a male, was never banded. We have no idea whatsoever why half their eggs didn’t hatch those two years. The wet, cold weather both years may have made hunting poor or kept Jenna off the nest too much, or Our Mysterious Stranger may be reaching the end of his reproductive peak, and some of his sperm may no longer be viable. It's also possible that Jenna is producing less viable eggs. 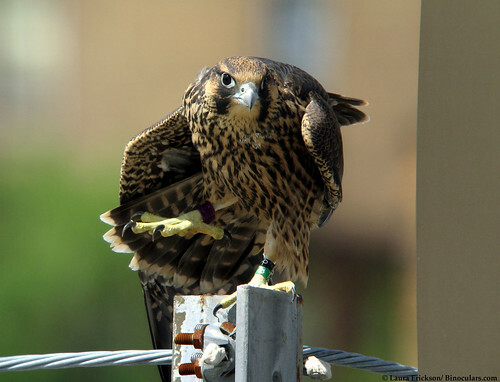 Banded, wild Peregrine Falcons have survived over 19 years. Our Mysterious Stranger is, at a minimum, 15 years old now, and could be older—we have no way of knowing. We do know that Jenna is 11 years old this year. We had much more favorable conditions for nesting in 2015, and Jenna and Our Mysterious Stranger appeared right on schedule. But in a sad plot twist worthy of the finest TV soap, another male turned up, too—a young guy still approaching his prime, who had been banded as a nestling in Cloquet two years ago. Without a soap opera's musical soundtrack, we can’t guess what Jenna thought about all this. Did she want a new mate to improve her chances of raising young? Was she simply growing tired of Our Mysterious Stranger, yearning for a change of pace? Might she have been having a midlife crisis? Whatever she was thinking, she and the New Kid on the Block set up housekeeping on a different nest box, further west, on Duluth's Torrey Building. Her own fertility is still something of a question mark: she produced four eggs, but only two hatched. The new male may be showing superficial politeness to his elder, may be intimidated by the more experienced unbanded male, or maybe just hasn’t found a reason to fight, so both males have been hanging around all summer without any noticeable battles. Our Mysterious Stranger seems mystified by the turn of events—he’s been seen by many people circling over downtown, carrying food and calling. That used to be the signal to Jenna that he was bringing provisions to her and the chicks, and even now, she’s been seen flying up and accepting his gifts—but then she carries them off to her new nest, and he flies back to the old nest box on the Greysolon Building alone. 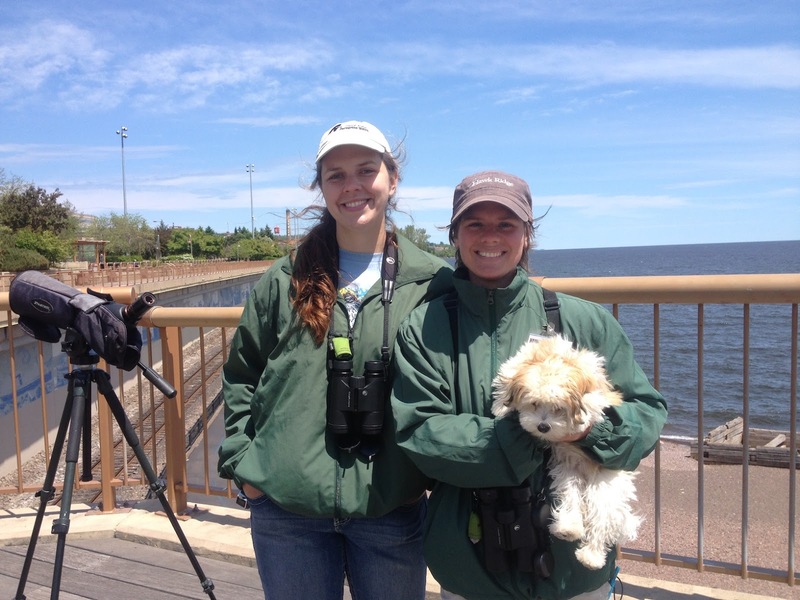 Katie Swanson, and Pip the Birding Dog at Lake Place Park, June 2015. When this year’s two chicks were banded, no blood samples were taken, so we don’t know if the new young male fathered both of them or whether Jenna was also engaging in a bit of hanky-panky with her reliable old mate. So in another twist worthy of the finest television soap opera, the chicks may be siblings or only half siblings—their true parentage is a question in their mother’s past. Regardless of who their father(s) may be, this year’s chicks have a better chance than most of surviving, what with having two males bringing food to their mother. Like the best of soap operas, the continuing saga of Duluth’s Peregrine Falcons has no ending in sight. Our Mysterious Stranger is so far the one character who has been part of the storyline from the first season. We know that, like Mrs. Chancellor or Victor Newman from The Young and the Restless or Erica Kane from All My Children, his pivotal role in our local soap will eventually come to an end. But as long as Peregrine Falcons continue to fly in Minnesota, this is one soap opera that will go on and on, regardless of sponsors, and regardless of ratings. And the offspring Our Mysterious Stranger and Amy and Jenna and The New Kid on the Block have produced will live on, to produce more young, to ensure more soap opera storylines well into the future.